Photo: PM Sheikh Hasina chairs at the weekly meeting of the Cabinet at the Secretariat. Dhaka, Oct 15 : The Cabinet on Monday approved in principle the draft Broadcast Bill 2018 with a provision to form a seven-member Broadcast Commission to provide licences to broadcast media, including online ones and to bring those under discipline. 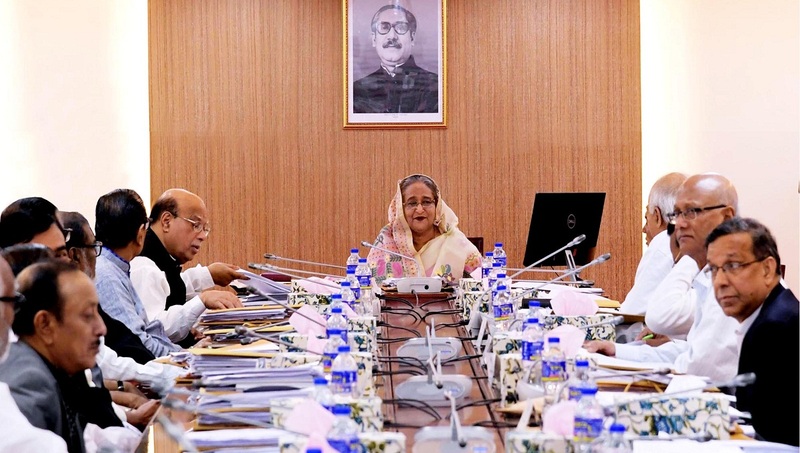 The approval came at the weekly meeting of the Cabinet held at the Secretariat with Prime Minister Sheikh Hasina in the chair. The Cabinet also approved the draft of Mass Media Employees (Services Conditions) Bill 2018 in principle with a provision to constitute wage board for journalists and employees of all media houses, including electronic ones. As per the Broadcast Bill, a five-member search committee will place its report before the President to form the seven-member Broadcast Commission, said Cabinet Secretary Mohammad Shafiul Alam while briefing reporters after the meeting. He said the President will appoint members of the commission, including a chairman and with at least a female member. “The Broadcast Bill 2018 is a new one which was framed following consultations with all stakeholders. The Bill has been placed (in the Cabinet) to bring the broadcast media, including online one, under discipline,” said the Cabinet Secretary. The Broadcast Commission will have the authority to provide licences to broadcast media and revoke those. But the Commission will have to take prior permission from the government in case of providing any licence in this regard. As per the Bill, the Commission will have to dispose of any complaint to be lodged against any media house within 30 days after receiving it. It will have the authority to suspend or revoke the licence of any broadcast media on seven grounds. About the Mass Media Employees (Services Conditions) Bill 2018, Shafiul Alam said the wage board will be applicable for journalists and employees of all the media outlets, including print and electronic, as per the Bill. According to the Bill, the working hours for media employees will be 36 hours in a week instead of 48 hours, while the casual leave will be 15 days instead of 10 days and the earned leave will be 100 days instead of 60 days annually, he said. Besides, the festival leave will be 10 days in a year, recreation leave will be one month after every three years, and the maternity leave will be six months in place of the existing eight weeks. If anyone or organisation violates the provisions of the Bill, s/he will be fined Tk 50,000-Tk 5 lakh, the Cabinet Secretary said.